I have noticed a trend lately with full skirts that hit at the “midi” length, somewhere between the knee and ankles and wanted to try it for work as I think that the full nature of the skirt makes it perfect for colder weather. And also, I’m so sick of pencil skirts, I’ve been boycotting them for awhile now, ha! 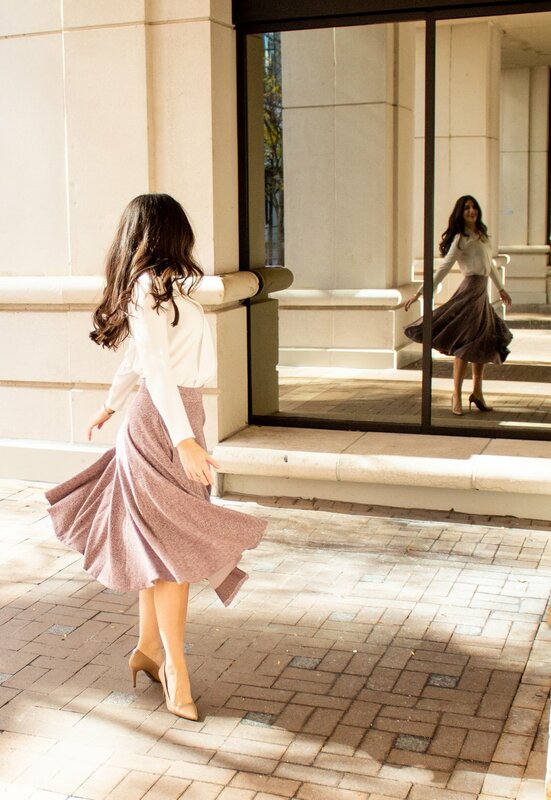 This skirt that I’m wearing below is from the brand, Gal Meets Glam, a brand started by blogger, Julia Engel. If you haven’t seen her collection yet, you should check it out! It’s full of timeless, classic pieces that have a very feminine twist. I bought this skirt and a dress (stay tuned for my next post on that!) and I’m really impressed with the quality of the pieces. I have only owned this skirt for a couple weeks and I have already worn it so many times, including to work, out to dinner, and to lunch meetings. These photos show how I paired it with a simple long-sleeved white top, which is a great look for work. The other times I’ve worn it out in more casual, or dressy settings, I’ve worn it with a black sleeveless turtleneck top, tucked in with a long gold necklace and black heels with the addition of a long camel coat. The color of this skirt is just gorgeous. It’s sort of pink, but had threads of gray running through it and it almost works with as a neutral. So far, I’ve been pairing it with a lot of camel/tan colors, black and white. It would also look beautiful with navy. I also really love the drape of this skirt. The fabric falls so that the skirt has a lot of movement when you walk, and since it’s so full, it’s really comfy and easy to to move around it. The waist is higher which is also great as it’s easy to tuck in tops. I can’t wait to show you my next GMG piece! Stay tuned for that. In the meantime, shop this look below! P.S. I also included a link to the lip color I’m wearing in these photos. I have been wearing it every day to work and it literally has matched everything from neutrals to bright red. It’s matte, but doesn’t dry out my lips like some of my other mattes. I highly recommend you try it if you’re looking for a new everyday lip color!